Easter is less than a month away and I’ve got my eyes on all that Easter candy in the stores. My weakness is the chocolate bunnies with crispy rice in them. Yum! I’m pretty sure I could eat an entire chocolate bunny in one afternoon so I haven’t bought myself one yet. 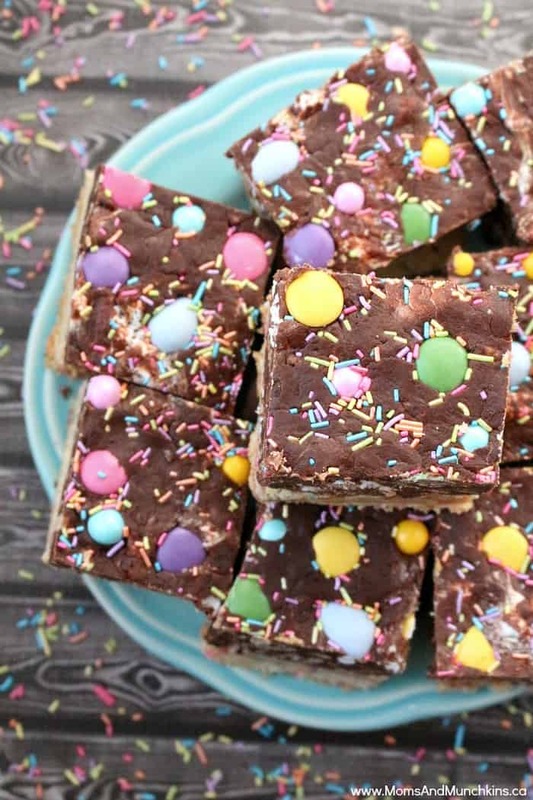 I’ve had a lot of sweets in the house lately with baking for the blog like the Chocolate Cherry Cheesecake, some Easter Bunny Bark (I’ll share the recipe with you in a couple of weeks) and these Easter Fudge Cookie Bars. 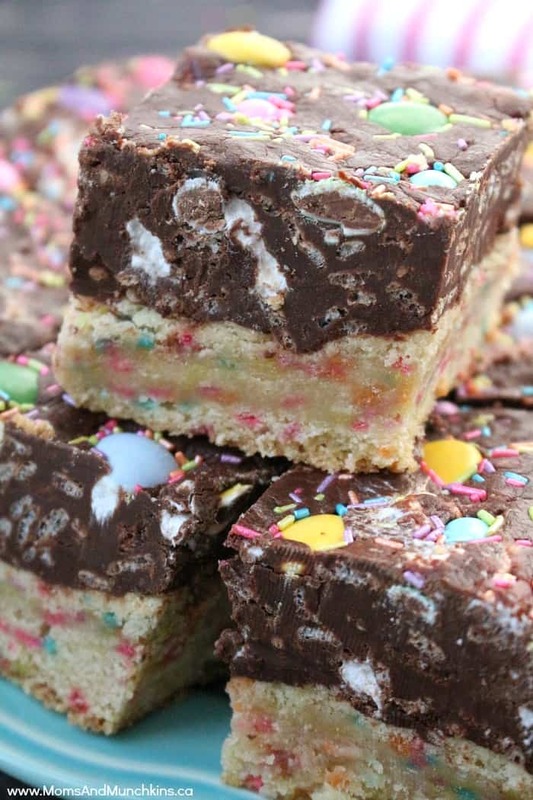 The fudge has marshmallow PEEPS in it plus Rice Krispies so it’s been satisfying my chocolate bunny cravings. 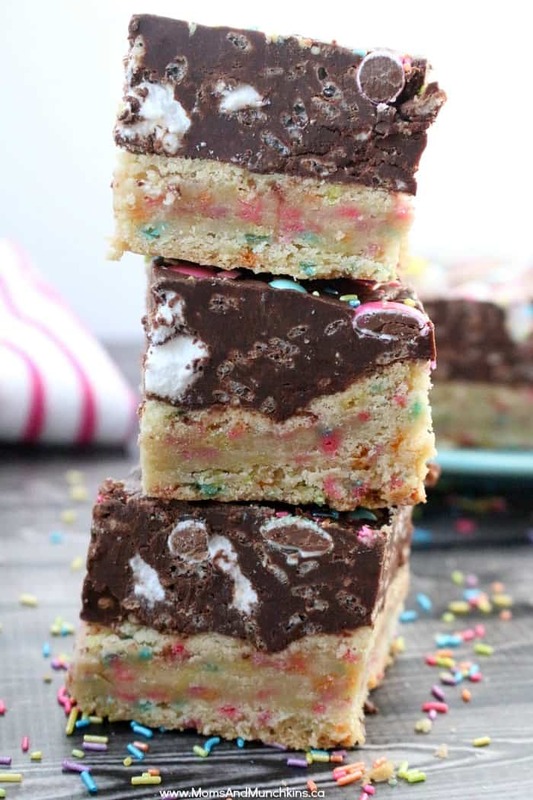 These bars have a funfetti sugar cookie base plus a thick marshmallow fudge layer topped with chocolate coated candies and plenty of sprinkles. 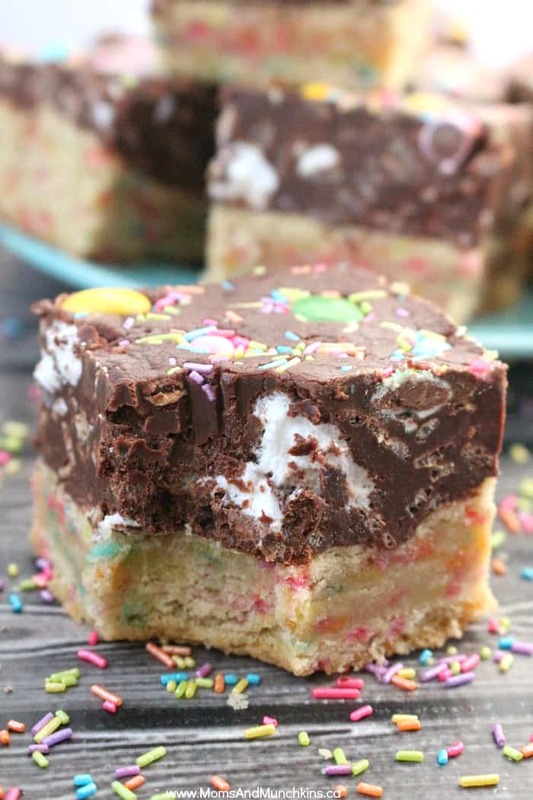 You’ll make these bars in two steps – the Funfetti Sugar Cookie base first then the Marshmallow Fudge second. 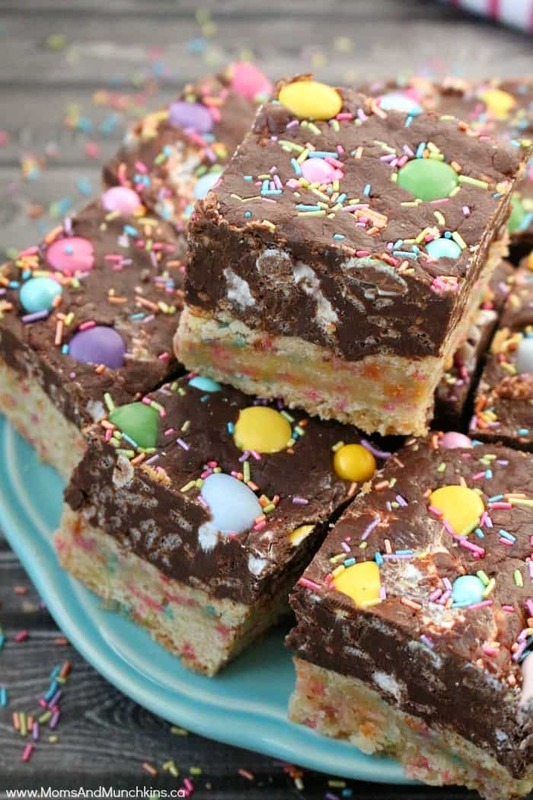 The two together is the ultimate dessert idea for your Easter celebrations. This would be a great recipe to save for Christmas baking exchanges too – just top it with red & green candies and sprinkles. Line a 9" square pan with parchment paper in the bottom and up the sides (it will help you remove the bars from the pan later). Add flour, baking soda and baking powder. Beat just until mixed. Press cookie dough into the pan evenly. Remove from oven and allow to cool slightly before topping it with fudge. On the stovetop, melt chocolate and condensed milk together in a pot over medium heat. Stir just until smooth. Stir continuously so it doesn't burn. Spread fudge evenly over the top of the cooked sugar cookie base. 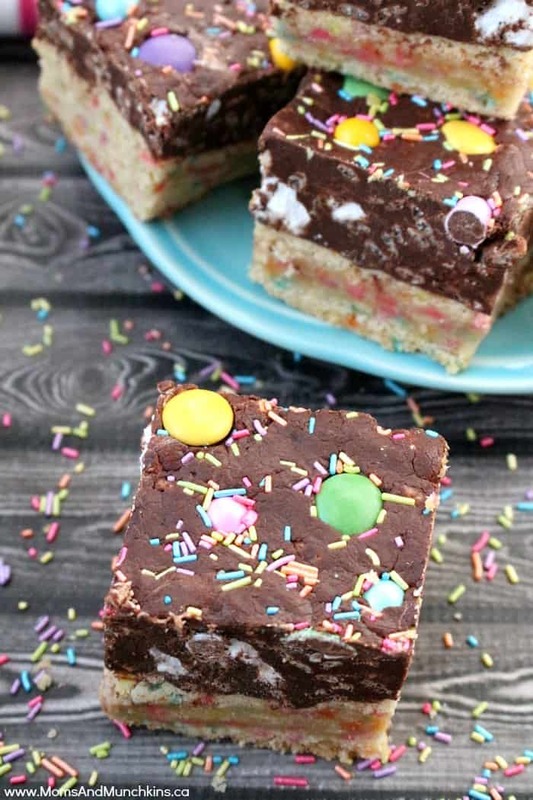 Sprinkle candies & sprinkles over top of the fudge and press down on the candies to push them into the fudge. Let it set in the refrigerator for at least 2 hours before serving. Lift from pan and cut into pieces. Store in the refrigerator. For more Easter treat ideas, visit our special Easter page! We have free printables, party ideas, treat recipes and more! Never miss an update by following us on Pinterest, Facebook, Twitter and Instagram. 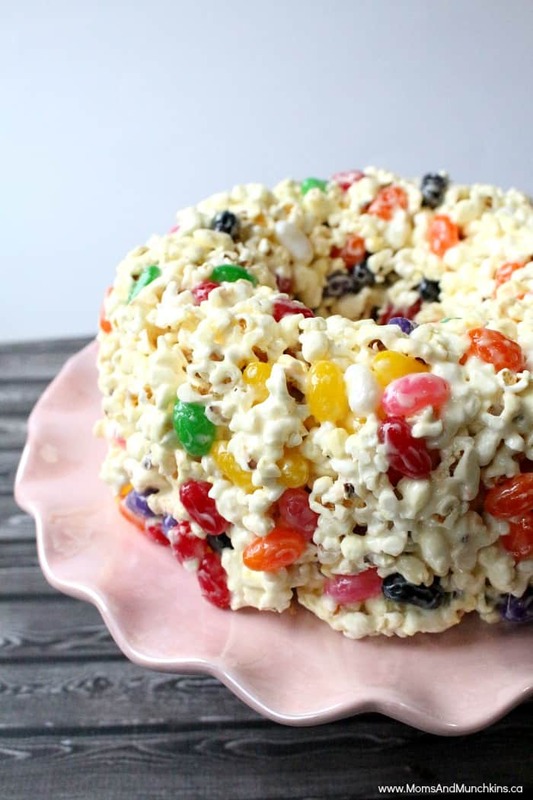 One of my favorites is this Popcorn Cake loaded with Easter jelly beans and gummy candy.